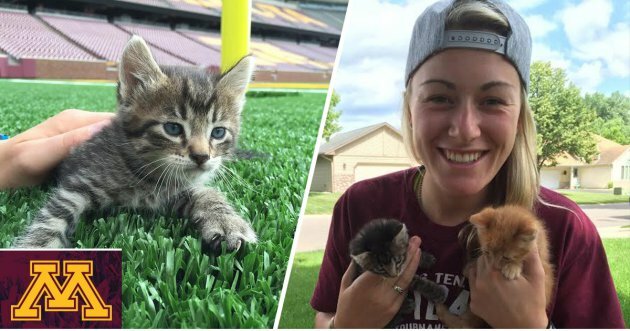 Kittens, not just Gophers, called TCF Bank Stadium home for part of the summer until Erika Rozell helped find the lost animals a home. Rozell, a junior catcher/utility player on the Gophers softball team, spent the summer as a stadium operations employee and after a couple weeks on the job learned about a stray cat roaming the stadium. A week later, the sightings included kittens. “Every time I worked, I went and looked in the places people said they had seen [the cats] to see if I could find them,” Rozell told GopherSports.com. Her persistence paid off. The Lakeville native found two kittens and took them to the Humane Society where they would meet their future owner, Marcy. “I got out of my car with the kittens in the carrier and [Marcy] insisted on seeing them and petting them,” Rozell said. After hearing the kitten’s story, Marcy offered to foster the animals and pay for all the vet bills. The two kittens, named Nigel and Thor, now live full-time with Marcy’s niece. Rozell continued to search TCF Bank Stadium for more lost cats and eventually found another kitten tangled up in netting. Rozell performed CPR on the weak cat to help prolong its life long enough to get it to a vet, but the kitten Tiny Tim later died. A week later, Rozell found another kitten she named Leo. The cat’s head was cocked to the side and had a hole dug into its neck from a parasite. The vet was able to put Leo on medication and remove the parasite, and after a couple weeks of care from Rozell and Marcy the cat was healthy. Leo now lives in a house with one of Rozell’s friends and her five roommates in La Crosse, Wis.